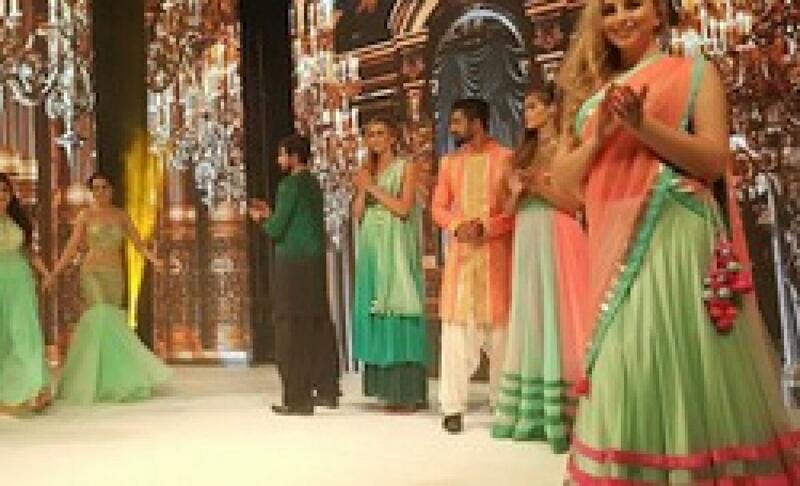 Indian Designer\'s Melange Line On Display In Dubai. Indian designer Archana Kochhar showcased her couture bridal collection titled MÃ©lange at the India Fashion Week Dubai 2015. Bollywood actress Celina Jaitly walked the ramp as the showstopper. New Delhi: Indian designer Archana Kochhar showcased her couture bridal collection titled MÃ©lange at the India Fashion Week Dubai 2015. Bollywood actress Celina Jaitly walked the ramp as the showstopper. Celina sported a fresh mint blue mermaid gown with gold metal work and sprinkle of gold Swarovski dust. Kochhar's line boasts of a melange of classic elegance with contemporary flair, shaped silhouettes and drapes. The silhouettes comprised of gown saris, keyhole anarkalis, flaring gowns, layered lehengas and short embroidered dresses. Â“MÃ©lange is a mix of traditional and contemporary, sleek trendy, flirtatious and feminine. It is an ode to the feminine form and expresses itself in soft fabrics and vivid hues. In all, the collection spells over luxury and captures the myriad shades of women," the designer said in a statement. The designs were dominated by colours of icy blue, coral orange and pink, gold and hues of black. An interesting concoction of fabrics like handmade textured raw silk, flat chiffon and georgette with surface embellishments like mirror embroideries, beaten gold and ivory thread work, metal work and Swarovski highlights, lends a unique and timeless appeal to the collection.